I´m install on my Canon 600D (Firmware 1.0.2) the latest Build of ML (2018-02-04). 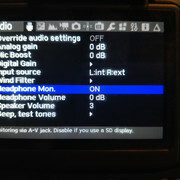 A small look @ the feature list say, I can use audio meters in video mode. But a look on my picture say, no audio meter option. Years ago, I installed Magic Lantern, where the audio meters functioned in video mode. Recording H.264: In Movie mode toggle screens by pressing INFO button until ML overlays appear. Global draw must be enabled.